Le Gabriel Restaurant Review at La Reserve, Paris France. The Palatial La Réserve Hotel & Spa’s 2 star Michelin restaurant Le Gabriel is one of the world’s finest and quintessentially Parisian. 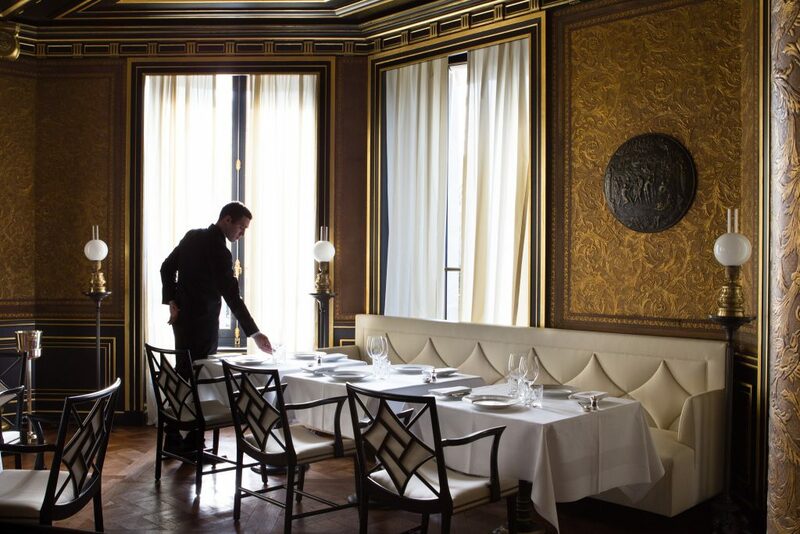 The striking interiors of 2 Michelin Star Restaurant Le Gabriel, Paris. There are people who actually believe Le Gabriel is the best restaurant in the world & they could well be right. It has exceptional food, stunning architecture and a knockout wine list. 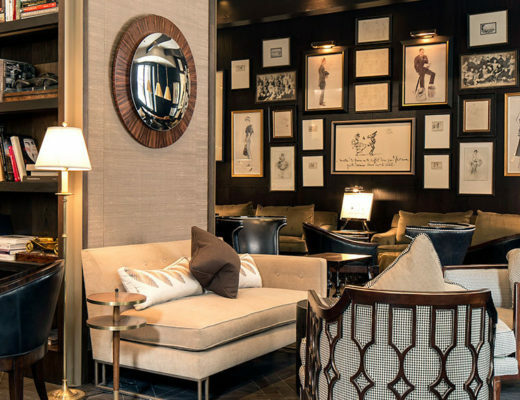 Staying at La Réserve hotel in Paris, one of the city’s most luxurious is an exceptional, once in a lifetime event. Amd many once in a lifetime events actually happen to guests when they stay, as for starters French President Emmanuel Macron’s tase is literally minutes away, and rumour has it David Beckham is a new fan and regular guest. 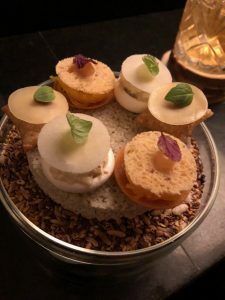 But dining in the intimate 40 seat restaurant with towering ceilings, at deco finishings and open fire in winter is a must for anyone passionate about the very best in food – and luxury. 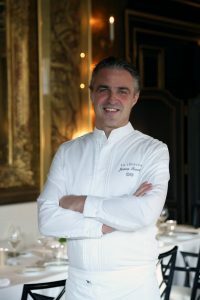 Chef Jérome Banctel was awarded a Michelin star within 12 months of opening it. He is one of Paris’ most lauded chefs. 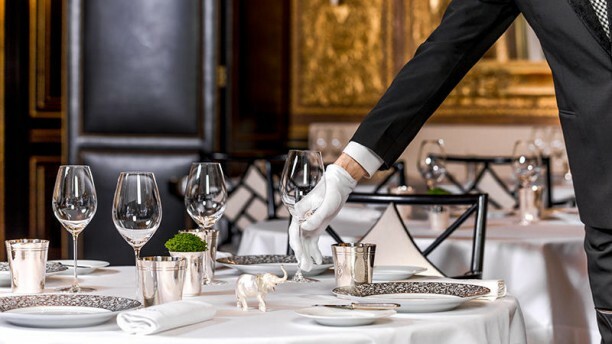 Banctel worked beside famed Parisian chef and entrepreneur Christian Constant, at 3 star L’Ambroisie and alongside Alan Senderens, France’s late leading cultivator of nouvelle cuisine. It is clear the years of working with some of the world’s best has paid off. 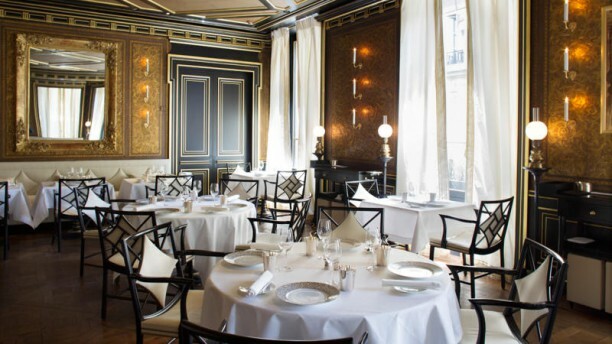 Le Gabriel restaurant is located on the ground floor of La Réserve hotel, in an elegant, classically French setting. It’s a French restaurant created for memories, romance and moments to be savoured. An immaculate Japanese couple in tuxedo and full kimono dined with fresh rose petals on the table the night we were there. You could see the thrilled in their faces as each course was served and devoured. Le Bar at La Reserve Hotel & Spa. Le Gabriel opens at 7pm, and the hotel’s bar, Le Bar is a gorgeous spot, one of my favourite in Paris for a drink beforehand and has some spectacular cocktails available mixed by professional mixologists. Plush red upholstered chairs, and dark wood filled with gold make this small, lush room romantic, intimate and exclusive. The cocktail list is stunning. The signature gin cocktail Bain de Folie was too much fun, served in a bath with a straw. The degustation begins with amuse bouche at Le Gabriel, Paris. 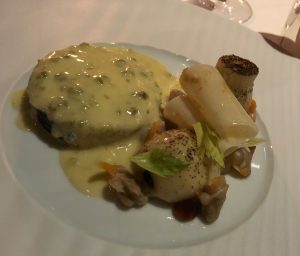 As soon as we sat down, the waiter brought us some amouse bouche, the French way to begin a meal, which were savoury style “macarons” elegantly presented with various flavours including foie gras. There were three each to be eaten in a particular order – and what a way to start the meal. A glass of champagne topped it off. We thought these were the start of the show – little did we know what was coming. Each bite was a tease of the magnificence to come throughout this meal. Each morsel was a taste sensation, and left us hungry for more. The feel in the restaurant is intimate, light, white and airy with gold accents and textured walls. Not too many tables are packed into the intimate setting, It is romantic, elegant, relaxed and luxurious. Incredible Japanese inspired dishes with French produce await at Le Gabriel, Paris. We chose the Experience menu, with matching wines, which was an exceptional adventure from start to finish. The chef, Jerome Banctel is inspired by Japanese cuisine, but focuses on fresh French produce. It creates taste sensations of the highest order. The first course was a plate of small seafood pieces in a sweet soy style sauce. The blend of French flavours from Brittany and Asian tastes from Japan was immediately apparent. A glass of the unique La D18, a dense white wine with the best of white and grey ganache matched perfectly with the sweetness of the sauce. Decadence at Le Gabriel, Paris. Second were aubergine pieces posing as mushrooms. I am not an aubergine fan, but loved this dish. Rich, full flavours oozed out of the meaty aubergine which was a generous portion size. A glass of the highly sought after kuheji eau de desir sake, from the cult brewery from Aichi was a surprising accompaniment. 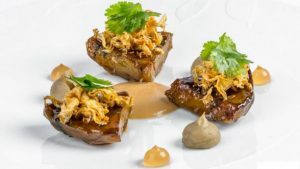 The sake has aromas of citrus, herb and fennel – highly unusual, but a great match for the aubergine dishes the alcohol cut through the meatiness of the aubergine within the dish. The setting at le Gabriel to dine on Chef Jérome Banctel’s amazing cuisine. Sea Bass shaped in a circle garnished with black lemon and cockles from Brittany had a touch of theatre with a white soy and wasabi sauce poured over it which again was a generous serving size, and a delicious dish. The rich texture of the fish combined with the creamy sauce and salty cockles was a delicate but full flavoured mix of seafood tastes. The burgundy Simon Biz & Fils Savigny-les-Beaune Les Bourgets 2015 had a beautiful sweet but light nose of cherries, truffles and raisins to accompany the sea bass. A pairing I may not have thought of but nevertheless enjoyed. 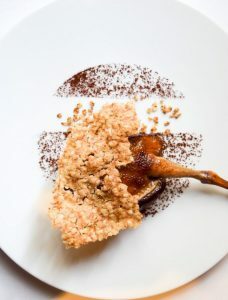 I was a touch terrified to be told the next dish was pidgeon, but when it arrived it was carefully constructed in a circular disk sitting on what looked like chocolate dust. The salty, sweet granules of the dust wrapped around the tender sweet meat, which was just sublime. The Cos D’Estournel Saint Estephe was my favourite glass of the meal. Rated as one of the top wines in the Saint Estephe region in Bordeaux, it was a rich, clean red, but not heavy. A delicate blend of merlot, cabernet sauvignon, cabernet franc and petit verdot. I can feel the need for a visit to Bordeaux coming on. A delicate lemon dessert looked more like art than dessert, and was a unique palate refresher. A thin, crunchy sweet layer sat atop a creamy, lemon cleanser which I ate in a few mouthfuls. Dessert at Le Gabriel, Paris. 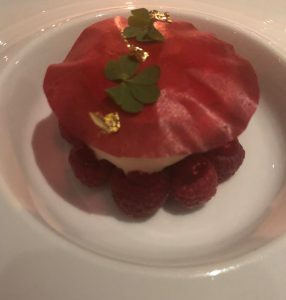 The strawberry dessert was a show stopper, and featured a cream later with tiny strawberries underneath, all sitting beneath a crisp sweet red lid. A light contrast to the main meals that had gone before, but a sweet, sugary taste thrill nevertheless. The Charles Heidsiek Rose Reserve could not have been a better pairing. Home made mint tea, made and garnished with fresh mint arrived with not one but two selections of petit fours – home made chocolates with nuts and tiny freshly baked buns filled with French cream. 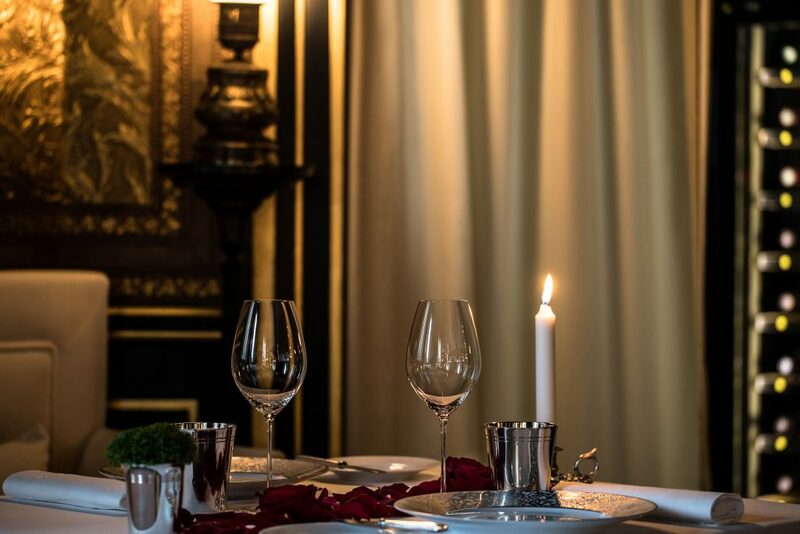 Le Gabriel, Paris is a setting for intimacy. 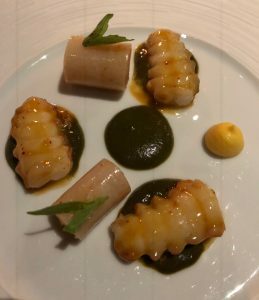 There is a lot of tradition about the food at this 2 Michelin star restaurant, but also modernity in the foods presentation and flavours. Serving sizes are generous but not too much. 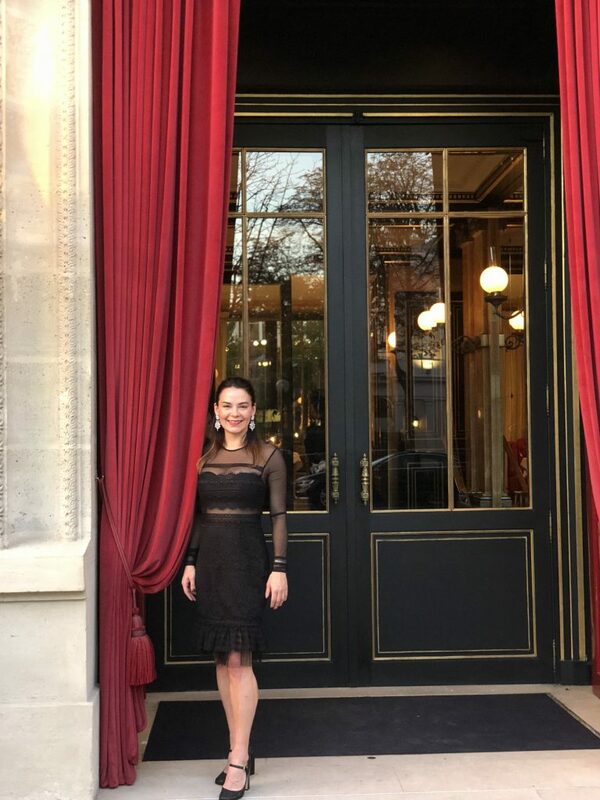 Renae Leith-Manos at the incredible Entrance to La Réserve Hotel, Paris. An amateur foodie might be tempted to call this fusion food, but rather it is a wonderful expose of the best of French cooking, and The Experience menu really is that, a true culinary adventure building to a crescendo within the main meals, and gently easing into a relaxed finish. To read my review of La Réserve hotel, click here. To Book Le Gabriel, click here.